Lyrognathus giannisposatoi Nunn & West, 2013, is a very stunning bird spider due to its coloration from Sumatra, Indonesia. 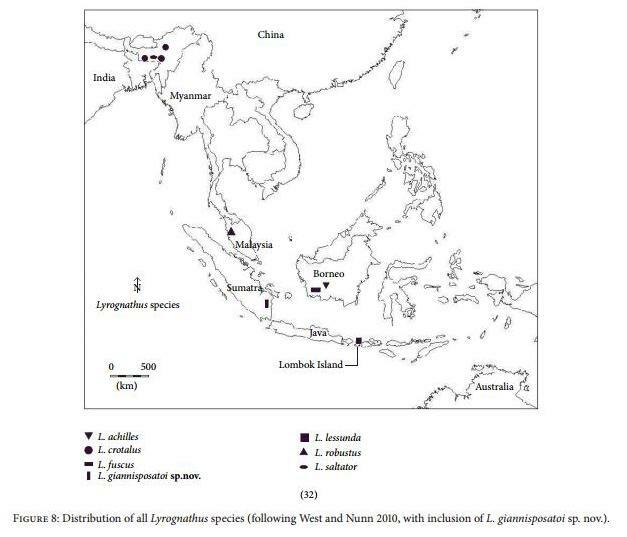 Spiders from the genus can be found in northeast India, West Malaysia, Borneo and the Lombok islands, but Lyrognathus giannisposatoi was the first spider from the genus to be recorded in Sumatra in 2012. Remarkably all Lyrognathus spp. can be found at higher elevations in mountainous area, except for Lyrognathus giannisposatoi. She prefers very low elevations. Lyrognathus giannisposatoi is closest related to Lyrognathus lessunda, but can be easily distinguished from all Lyrognathus spp. by its robust build and much larger overall size. The female is rather dark, with carapace and anterior leg pair I & II coloring dark brown. Abdomen and anterior leg pair III & IV are black. All leg segments possess indistinct cream bands. Males are smaller and more brown-ish. Origin: Mesuji, Lampung province, Sumatra, Indonesia. Span width: ≤ 11-14cm. Lyrognathus giannisposatoi is sexually dimorphic, with females being larger and heavier than males. Life expectancy: No valuable source found. Females probably become up to 12-15 years old. Males are given a shorter lifetime of 3-4 years. Behavior: Defensive. The spider will try to flee at first. Persistent provocation can result in a bite. 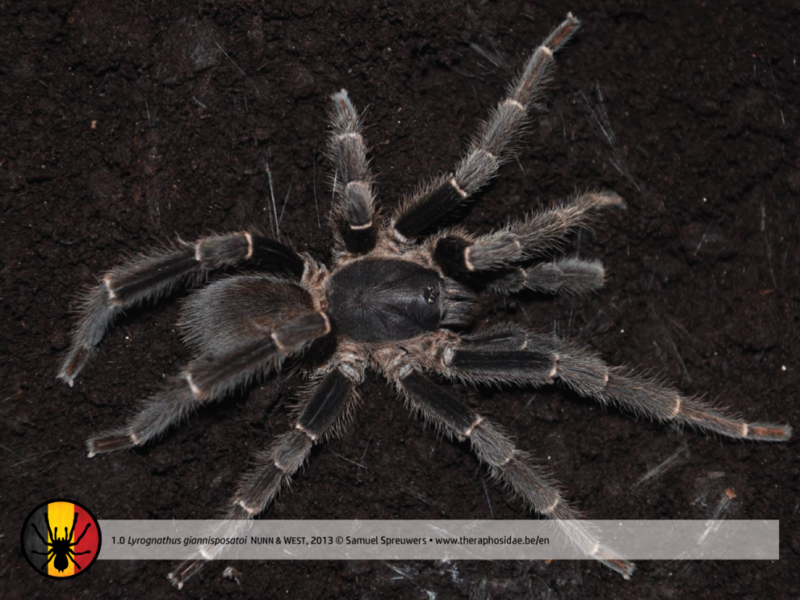 Lyrognathus giannisposatoi can be considered a pet hole, so know what to expect when buying. Lyrognathus giannisposatoi lives in tropical warm and humid area and can be found at very low elevation, mostly burrowed inside rises of land just above the flood plains of the Mesuji river. This region, however, is suffering from human activities. The spider is often found in uncleared patches of gallery forests. Temperatures in general are high, but lower inside their burrows. Do not overheat the terrarium. The genus in general doesn’t like high temperatures, as they all live on high elevations. Lyrognathus giannisposatoi, however, lives at very low elevation, being a little bit warmer. Temperature: 23-27°C (day), 18-22°C (night). Adult: LxWxH: 20x20x40. Min. 2x span width in height. * Keep substrate rather moist. Provide a more dry area at one side of the tank.  * During 7-8 months the spider lives in very humid area. Note that cages with high humidity levels are very sensitive for mites. Please take your precautions. * Note: Lyrognathus giannisposatoi can be found at very low elevation, burrowed inside rises of land just above the flood plains of the Mesuji river. Wet season: All year long. In january, february, march, april, may, november and december it will rain at least 1 out of 2 days. Dry season: June, july, august, september, october. With an avarage rainfall for 1 out of 2 or 3 days, it’s not really “dry”. Warmest months: September, october, november. In their natural habitat males mature and breed in july, while females produce the egg sacs in the same month. Remove the male immediately after mating. Cannibalism may occur. • 1-5 months after mating, the female will start making the cocoon. Deprive the cocoon, when desired, 5 weeks later. Store the eggs at a humidity of 80-90% and a temperature of 24-27°C. Expect 200-300 spiderlings to come out. • Don’t plan too much breeding this spider. Just make sure humidity is around 80% and temperatures are not too high (or too low). • Lyrognathus giannisposatoi is a patronym in honoration of Mr. Gianni Sposato who delivered lots of valuable information about Selenocosmia and assistance to the authors? • Lyrognathus giannisposatoi has 4 different types of hair on her carapace? 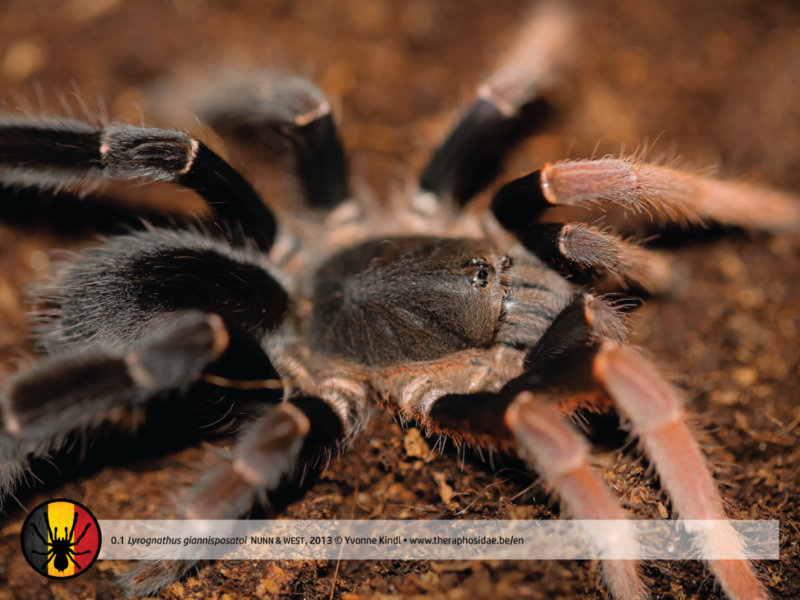 • A new species of tarantula spider in the genus Lyrognathus Pocock, 1895 (Araneae, Theraphosidae) from Sumatra.